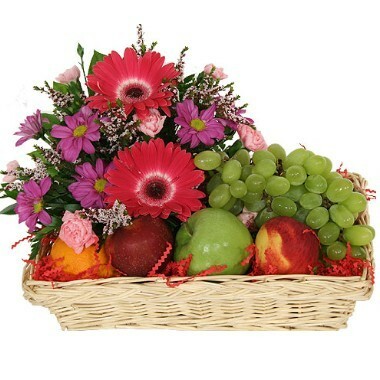 Send beauty and bounty with this lovely combination of fresh fruits and flowers. Perfect for so many occasions and sentiments or "just because". Two red gerberas, six pink carnations, purple daisies with baby's breath. apples, peaches and grapes. Please note that the fruits are seasonal and may not be available throughout the year.